She walked out, but can she walk back in? Why do readers LOVE Virginia Macgregor? This heartwarming bestseller is the perfect read for anyone who enjoyed The Keeper of Lost Things, Joanna Cannon, Jojo Moyes and Eleanor Oliphant is Completely Fine. 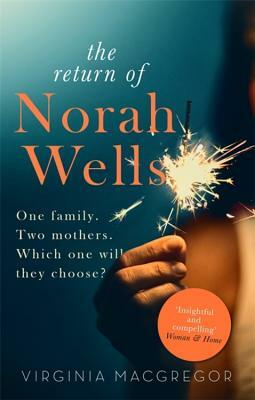 One ordinary morning, Norah Wells walked out of her house and never looked back. Six years later, she returns to the home she left only to find another woman in her place: Fay. Now that Norah has returned, everyone has questions. Where has she been? Why did she leave? And the most pressing question of all: what happens to The Mother Who Stayed when The Mother Who Left comes back? Virginia Macgregor is the author of What Milo Saw, The Return of Norah Wells, Before I Was Yours and, most recently, the young adult novel Wishbones. Her work has been translated into over a dozen languages. After graduating from Oxford University, she worked as a teacher of English and Housemistress in three major British boarding schools. She holds an MA in Creative Writing, and was, for several years, Head of Creative Writing at Wellington College. Virginia now writes full time. She is married to Hugh, who is Director of Theatre at St. Paul's School in Concord, New Hampshire. They moved to New Hampshire from the UK in July 2016 and live in St. Paul's with their two daughters, Tennessee Skye and Somerset Wilder. Keep in touch with Virginia on Twitter (@virginiawrites), Instagram (virginiamacgregor), Facebook (virginiamacgregorwrites) or via her website www.virginiamacgregor.com.